There is really no way to figure out if there is anything resembling a plot for Suicide Squad, not with the film’s awful pacing and sloppy editing. But let’s try to narrow it down. Set after the events of Batman v Superman, a group of the worst of the worst criminals are forcefully recruited by Amanda Waller (Viola Davis), a government official (or at least a shell of one). These criminals come together against their will to be a deterrent to any human and/or metahuman threat. In exchange for their services, they can have their sentences commuted or die trying – or just die if they try to escape. So she finds the baddest in Belle Reve Penitentiary, a prison located in the swamps of Louisiana, and brings together Deadshot (Will Smith), an expert marksman and assassin for hire; Harley Quinn (Margot Robbie), the love of Mr. J’s life and just as deranged as the clown prince of crime; Captain Boomerang (Jai Courtney), a crazy Aussie with a thing for boomerangs and an odd pink unicorn fetish; El Diablo (Jay Hernandez), a gangster with the power to harness and control fire; Killer Croc (Adewale Akinnuoye-Agbaje), a walking scaley human-crocodile hybrid; Slipknot (Adam Beach), a guy with a thing for ropes, and Enchantress (Cara Delevingne), who is really June Moone, an archeologist whose body is inhabited by the mystic force. All but Enchantress get these rice-grain bombs implanted in their heads, but more on why the witch didn’t get to participate in the fun later on. They are led by the All-American patriot Rick Flagg (Joel Kinnaman), whose skills seem to go as far as threatening to ignite the bomb or make rash decisions based on his puppy dog love for June. And along for the ride is Katana (Karen Fukuhara), a swordswoman whose sword can trap the souls of any victim she slices. 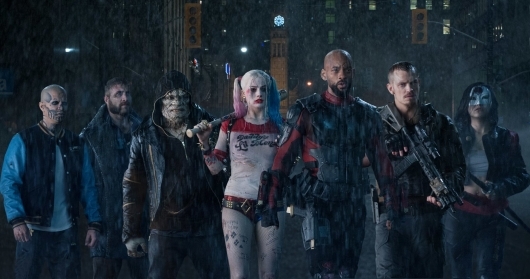 Based on the film’s marketing led us to believe that Suicide Squad would be fun with an energetic soundtrack, something that mirrors Marvel Studios’ Guardians of the Galaxy. And yes, these convicts and misfits seeking redemption through acts of heroism sounded like a decent premise, one that DC’s shared universe so desperately needed. But a lot of the humor is wasted because of inconsistent tones. This sloppy editing amounts to what looks like a bunch of trailers that have been stitched together, with each of these trailers revealing a little bit of the plot, but have no coherence or clarity because it has no sense to tell a story in chronological order. So any impact that these twists are supposed to have are squandered. It’s hard to believe that the trailers really didn’t spoil the story because the film itself is just full of trailer moments. There is no plot, at least no plot that makes any sense. So what was suppose to be a twist turns out to be something that equates to the gasping reaction that Scooby-Doo and the Gang get after they unmask the monster. It’s silly, stupid, and rather forgettable. Without a serviceable plot, these characters have nowhere to go. Some of their motivations are in the right place. Deadshot is a family man, deep down Harley wants to have a family herself, and El Diablo – who is the real star of the film – is looking for a new family after he tragically took the lives of his own. Then there is Rick Flagg, the good boy soldier who loves June and will do anything to save her from Enchantress, who is now considered the villain by means of throwing her character around thanks to her powers of magic and the magic has terrible editing, too. So our Squad now has to save the city from whatever it is that Enchantress is doing or wants to accomplish. She’s turning the citizens of the city she invaded into hideous soldiers that will protect “the swirling ring of trash in the sky.” Who knows why it’s up there or what kind of purpose it serves, all you need to know that it is bad and the bad guys are there to stop it from staying there. Honestly, it was never really established why the floating trash is a threat or maybe that part just got lost. Or maybe it really is just a giant swirling metaphor for the movie. I don’t know, and I am am starting not to care. These characters just seem to be walking from street to street entering buildings and exiting them, moving by whatever number the die rolls on, making the film look less like Suicide Squad and more like Monopoly with Guns. As the film progresses, you can’t even say whatever is happening to them is out of convenience, the plot just moves and the characters just follow along aimlessly. Then there are the flashbacks. But just be glad that there isn’t a vision within a dream. These flashbacks do at least give a little backstory to our Squad, some of them revealing a softer side to members like Deadshot and El Diablo, while Harley Quinn gets a more exciting one given her relationship to the Joker (Jared Leto). But we soon learn that these criminals have a lot more in common than they think. But film never really gives them a chance to develop into the believable heroes that they can be. And when they are given a moment to shine, the film reverts back to making loud noises for the sake of being an action sequence. In an attempt to make the film more entertaining, the entire first act of the film makes great use of pop songs from Eminem’s “Without Me” and Kayne West’s “Black Skinhead to K7’s “Come Baby Come” and oddly enough Norman Greenbaum’s “Spirit In The Sky.” But one can’t help feel that they are cueing exposition. And sure, the visuals are, well, good, but it just adds a bit more shine. Suicide Squad is just not the film we were promised or perhaps it is a film that we were promised considering that it looks like a bunch of trailers that use some of our favorite songs all stitched together for a poor excuse of a final product. There are some barely likable characters, great use of music, and some coherent action sequences, but they are not enough to overshadow the obvious editing and pacing problems, a weak plot, a stupid villain, and a clear line of creative division between the director and the studio. One thing is for sure, Wonder Woman is going to have to be beyond spectacular for me to have any sort of faith in the future of the DCEU.